Saint Andrew was born in Florence in 1301 of the illustrious Corsini family. A short time before the birth of Saint Andrew, his mother experienced a strange dream, in which she had given birth to a wolf which became a lamb upon entering a Carmelite church. After a dissolute youthful life Andrew repented, when one day in 1318 his desolate mother told him of her dream. He rose and went to the altar in the church where his parents had offered to God the child they hoped to obtain from His mercy; there he prayed to the Blessed Virgin with tears, then went to beg his admission to the Carmelite Order. 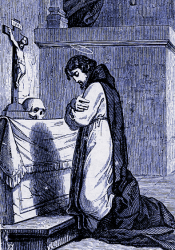 He began a life of great mortification. Ordained a priest in 1328, he studied in Paris and Avignon, and on his return became the Apostle of Florence, and Prior of his convent there. In 1360 he was consecrated Bishop of Fiesole, near Florence, and gained a great reputation as a peacemaker between rival political factions and for his love of the poor. He was also named papal nuncio to Bologna, where he pacified dissenting factions and won the hearts of the nobility with whom he was associating. He wrought many miracles of healing and conversion during his lifetime. At the age of 71, while he was celebrating the midnight Mass of Christmas, the Blessed Virgin appeared to him and told him he would leave this world on the feast of the Epiphany, to meet the beloved Master he had served so faithfully. In effect, he died on that day in 1373, in the thirteenth year of his episcopacy. Miracles were so multiplied thereafter that Pope Eugenius IV permitted a public cult immediately. The city of Florence has always invoked him with confidence and happy results. He was canonized in 1629. He is often represented holding his crosier, with a wolf and a lamb at his feet, or hovering over a battlefield on a cloud or a white steed — this in memory of his miraculous intervention in a battle the Florentine people won by his assistance. “When Jesus had crossed again in the boat to the other side, a large crowd gathered around him, and he stayed close to the sea. She had suffered greatly at the hands of many doctors and had spent all that she had. 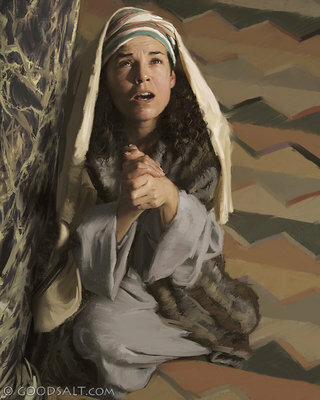 The woman, realizing what had happened to her, approached in fear and trembling. He did not allow anyone to accompany him inside except Peter,James, and John, the brother of James. He took along the child’s father and mother and those who were with him and entered the room where the child was. (At that) they were utterly astounded. He gave strict orders that no one should know this and said that she should be given something to eat.” -Mark 5:21-43.